Awesome indie designer Aileen, of the The Sunroom blog, has done it again – this time offering a free crocheted cowl pattern that is both practical and beautiful. Look around the shops for fall jackets or winter coats and you’ll see a plethora of beige, brown, gray and black; best-selling neutral colors designed for artful blending with your current wardrobe. Functional, yes. But even as you take the coat from the hanger, you already know: it’s assembly-line, cookie-cutter boring. Now think lipstick. And of how much a small application of glossy lipstick illuminates the neutral palette of facial makeup. 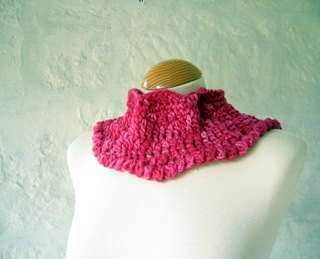 Look again at this crocheted Lipstick Cowl. Now imagine how this vibrant clothing accessory will complement and enhance even the most conservative of autumn or winter wardrobes. Quick to make, versatile and so much punch for so little effort. Gotta love it. Très chic, très hip! Notes: The cowl is worked in the round. 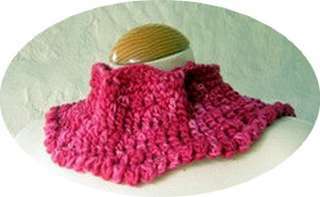 The properties of the yarn give the cowl a contemporary look. Measurements: 25” x 5” approx. Ch 64, join with a sl st.
Rnd 1: sk 1st st, *sc, htr, dc, tr, dc, htr, sc, sl st*, ** rep to end. Rnd 2: sc all around. Rnd 3: *sc, htr, dc, tr, dc, htr, sc, sl st*, ** rep to end. Rnd 4: tr all around. Rnd 5: tr all around. Rnd 6: *sc, htr, dc, tr, dc, htr, sc, sl st*, ** rep to end. 1 st st, *dc, sl st in same stitch*, ** rep to end. This pattern is offered and made available for personal use only. See more free crochet patterns, plus inexpensive crochet and knitting patterns, from indie designer Aileen, at The Sunroom blog.